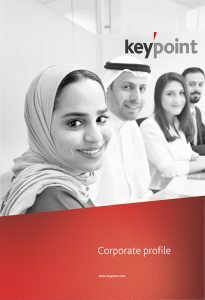 Keypoint was founded in 2006 and adds value with professional advisory services in the Kingdom of Bahrain and across the region. We have offices in Bahrain, Saudi Arabia and Jordan. Our clients range from large multi-nationals and financial services institutions to family-managed conglomerates and small and medium-sized enterprises. Our fund administration and trust services are licensed and regulated by the Central Bank of Bahrain. We are authorised by the Bahrain Bourse as a sponsor for the Bahrain Investment Market. Keypoint employs over 100 qualified, experienced professionals, including lawyers and members of the Institute of Chartered Accountants, the Institute of Chartered Financial Analysts, the Institute of Internal Auditors, the Chartered Institute of Personnel & Development, the Institute of Chartered Tax Advisors and the Institute of Certified Fraud Examiners. Our professionals also hold degrees in a wide range of subjects including law, IT, banking & finance, accounting, economics, management, HR and business administration. Our IT professionals hold a range of specialised IT qualifications, including CISCO, Prince 2, ISO 27001L1 and ISO 22301, as well as information system security credentials. Keypoint is one of the GCC’s most comprehensive providers of professional business services. For over a decade, our dedication and innovation have made us the consultant of choice to local and regional firms, multinational corporations, financial institutions, high net worth individuals, small and medium-sized enterprises and family offices. Clients value our skilled, specialised professionals because they allow businesses to redeploy expensive resources from administrative responsibilities to core business areas where they are more likely to add significant value and help companies develop a comparative advantage. Our ambition is to be the region’s leading professional business services provider by consistently providing a full range of reliable, cost-effective and smart business services to help organisations overcome challenges and increase efficiency.